TA DA!! Secret Squirrel will pop up anywhere ya'll! Hmm...Nice Nikon you have here! damn humans just screwed my photo!! Me, John and Rat visited the famous lake. 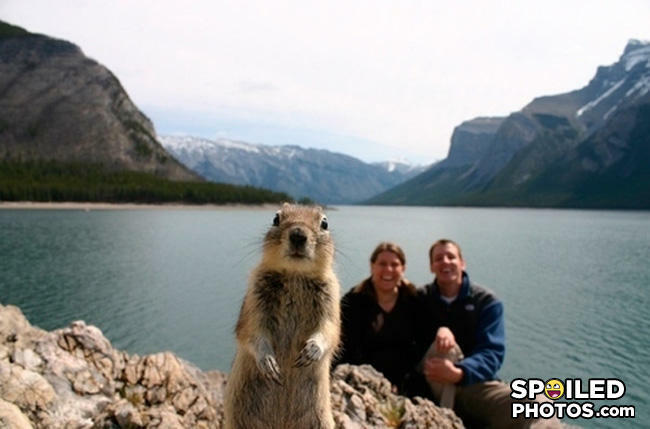 With all these damn tourists a squirrel can't get a decent photo taken! Freakin' Canadians spoil everything! Looks like Dramatic Chipmunk is pining for the fjords. "And behind me, we can witness the mating rituals of the hominids of the subspecies homo sapien dweebus"
two pathetic humans spoiled the photo! arghhhhh! have you seen my mommy??? Photoshopped. Clearly. Why would they position a camera with a rock in the foreground so blatently? If you remove the foreground, you have a normally composed image. With the foreground added the composition is skewed towards an alien object inserted into the image; in this case, the critter. Given the comments here, I've already determined this site is like 9gag, filled with retards. I'm out of here. Y the hell did the people photobomb this cute little guys picture?!?! Now if you just do what we say, you can have your two humans back. Dude, take the picture again. You didn't get my good side. What did the man on the moon say?